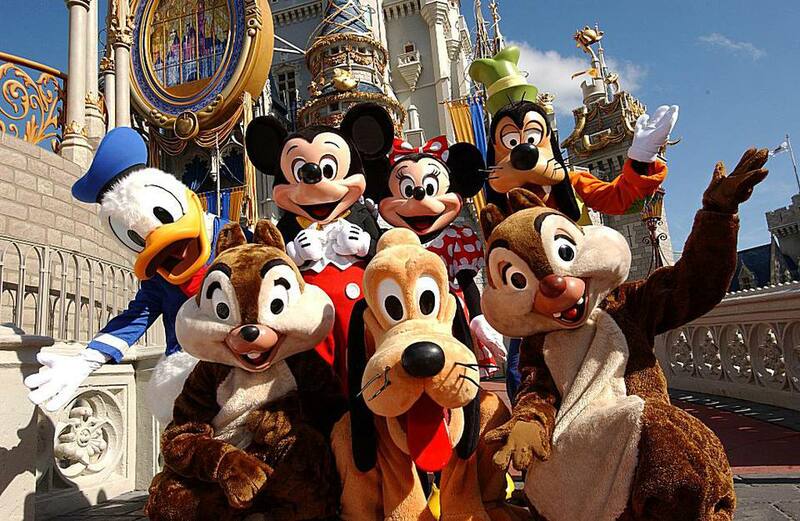 For many kids, meeting a beloved character is a highlight of any trip to Disney World. If your child has a favorite character, don't have to leave it up to chance. Disney's new MyMagic+ planning system makes it easy to schedule character experiences (as well as dining, rides, and other attractions) even before you leave home. Meet classic Disney friends at Town Square and Town Square Theater on Main Street U.S.A. at the Magic Kingdom. This is one of the most charming meet-and-greets in the park. Meet Donald Duck and Goofy as daredevil circus stars at Pete's Silly Sideshow in Storybook Circus, located in Fantasyland at the Magic Kingdom. Meet Minnie, Daisy, Donald and Goofy as vaudeville performers at Pete's Silly Sideshow in Storybook Circus, located in Fantasyland at the Magic Kingdom. You can also see Mickey, Minnie and dozens of Disney characters in the Festival of Fantasy Parade. You can see Mickey, Minnie, and plenty of Disney and Pixar characters in the Move It! Shake It! Celebrate It! Street Party on Main Street U.S.A. at the Magic Kingdom. Meet Mickey, Minnie and Goofy at the Epcot Character Spot in Future World at Epcot. Meet Donald Duck at the Mexico Pavilion in the World Showcase at Epcot. Dine with the chipmunks at Chip 'n' Dale's Harvest Feast at The Garden Grill in Future World at Epcot. Meet Mickey and Minnie at Adventurers Outpost on Discovery Island at Disney's Animal Kingdom. Meet Donald Duck on the Cretaceous Trail in DinoLand U.S.A. at Disney's Animal Kingdom. Meet Chip 'n' Dale at Rafiki's Planet Watch, located in Africa at Disney's Animal Kingdom. Meet Mickey, Minnie and friends at the Hootin' Tootin' Hoedown in Mickey's Backyard BBQ at The Campsites at Disney's Fort Wilderness Resort. Dine with Mickey and friends at Chef Mickey's Fun Time Buffet at Disney's Contemporary Resort. Dine with Minnie at the Minnie's Beach Bash Breakfast in the Cape May Cafe at Disney's Beach Club Resort. Dine with Goofy and friends at the Good Morning Breakfast at Ravello in Disney Springs. At Disney's Hollywood Studios, you can attend the wildly popular audience-participation show "For the First Time in Forever: A Frozen Sing-Along Celebration." Meet the sisters from Disney’s Academy Award-winning film "Frozen" at the Royal Sommerhaus in Epcot. You can also see Anna and Elsa in the Festival of Fantasy Parade every afternoon in the Magic Kingdom. Catch the sisters' snowman pal Olaf at Echo Lake in Hollywood Studios park. The Disney animated classic "Beauty and the Beast" provides the backdrop for much of Fantasyland at the Magic Kingdom. At Enchanted Tales with Belle in the Magic Kingdom's Fantasyland, guests can portray a character from “Beauty and the Beast” and join Belle and Lumiere in an interactive storytelling experience. You can meet Belle at Epcot's France Pavilion. Meet the incorrigibly manly Gaston in the French courtyard near Gaston's Tavern in Fantasyland. The crowning jewel of Fantasyland is Be Our Guest Restaurant in Beast's Castle, which immerses diners into the elegance and fairytale charm of Beast's world in three richly appointed rooms that bring the story to life. Beast often appears at the end of dinner. Belle is often present at Princess Storybook Dining at Akershus Royal Banquet Hall in the Norway Pavilion at Epcot. Meet Ariel from "The Little Mermaid" inside Ariel's Grotto, tucked into the rocks beyond Prince Eric’s Castle in Fantasyland at the Magic Kingdom. You can also see Ariel in the Festival of Fantasy Parade. Ariel is often present at Princess Storybook Dining at Akershus Royal Banquet Hall in the Norway Pavilion at Epcot. Meet Merida from "Brave" inside Fairytale Garden, located in Fantasyland at the Magic Kingdom. You can also practice archery, and color your own “tapestry” of Merida and her horse, Angus, and interact with the three mischievous bear cubs from the film. You can also see Merida in the Festival of Fantasy Parade. Meet Cinderella at Princess Fairytale Hall, located in Fantasyland at the Magic Kingdom. Dine with Cinderella and classic princesses at Cinderella's Royal Table in Fantasyland. You can also meet Fairy Godmother at Bibbidi Bobbidi Boutique in Fantasyland. Enjoy the Cinderella's Happily Ever After Dinner at 1900 Park Fare at Disney's Grand Floridian Resort & Spa. Cinderella is often present at Princess Storybook Dining at Akershus Royal Banquet Hall in the World Showcase at Epcot. Meet Princess Jasmine and Aladdin in the Agrabah Bazaar in Adventureland at the Magic Kingdom. Meet Aladdin and Princess Jasmine near Restaurant Marrakesh in the Morocco Pavilion at Epcot. The first stop for any Toy Story fan should be Hollywood Studios' Toy Story Land, a section of the park built to look like Andy's backyard. Buzz, Woody, Jessie, and plenty of Little Green Army Men all make regular appearances. Meet Buzz Lightyear at Star Command Headquarters in Tomorrowland at the Magic Kingdom. Meet Woody and Jessie near Splash Mountain in Frontierland at the Magic Kingdom. Meet Rapunzel from "Tangled" at Princess Fairytale Hall, located in Fantasyland at the Magic Kingdom. You can also see Rapunzel in the Festival of Fantasy Parade. Princess Aurora from "Sleeping Beauty" is often present at Disney's Perfectly Princess Tea Party in the Garden View Tea Room at Disney's Grand Floridian Resort & Spa. Is there a Padawan in your family? At Hollywood Studios, a selection of kids ages 4 to 12 can don brown robes and enter the Jedi Training Academy for a 20-minute session that sharpens their lightsaber skills and ends with the Jedi Oath and an encounter with the Dark Side. The academy is located in Echo Lake at Hollywood Studios. Note: You need to register your child for this experience at a specific time. Witness Captain Phasma and obedient storm troopers in the March of the First Order, which happens in Hollywood Studios. Meet Chewbacca and Kylo Ren at the Star Wars Launch Bay in Hollywood Studios. Meet Snow White at the Germany Pavilion in the World Showcase at Epcot. Seven Dwarfs Mine Train in Fantasyland at the Magic Kingdom. Meet Winnie the Pooh, Tigger, and friends near the Many Adventures of Winnie the Pooh in Fantasyland at the Magic Kingdom. Dine with Pooh and friends at The Crystal Palace on Main Street U.S.A. at the Magic Kingdom. Meet Winnie the Pooh and Tigger at the Supercalifragilistic Breakfast at 1900 Park Fare in Disney's Grand Floridian Resort. Meet Peter Pan in Fantasyland in the Magic Kingdom. Meet Tinker Bell at Town Square Theater in the Magic Kingdom. You can also see Peter Pan, Tinker Bell, and the Lost Boys in the Festival of Fantasy Parade. Meet Alice from Wonderland in the United Kingdom Pavilion at Epcot. Meet Alice and the Mad Hatter at the Supercalifragilistic Breakfast at 1900 Park Fare in Disney's Grand Floridian Resort. Meet characters from Wonderland at the Wonderland Tea Party at 1900 Park Fare in Disney's Grand Floridian Resort. Calling all superheroes: You can hit the dance floor with Mr. and Mrs. Incredible and Frozone during this outdoor Incredibles Dance Party that takes place on Rockettower Plaza in Tomorrowland at the Magic Kingdom. Meet Doc McStuffins and Disney Junior pals at the Animation Courtyard at Disney's Hollywood Studios. You can see Nick Wilde, Judy Hopps and plenty of Disney and Pixar characters in the Move It! Shake It! Celebrate It! Street Party on Main Street U.S.A. at the Magic Kingdom. You can catch The Royal Welcome of Princess Elena several times daily at Magic Kingdom Park's Castle Forecourt Stage. You can also see dozens of Disney characters in the Festival of Fantasy Parade. Meet Mulan at the China Pavilion in the World Showcase at Epcot. Meet Joy and Sadness from "Inside Out" and Baymax from "Big Hero 6" at the Epcot Character Spot in Future World at Epcot. Located in The Seas with Nemo & Friends pavilion at Epcot, Turtle Talk With Crush is an interactive show where you can have a personal conversation with the laid-back turtle. Meet Rafiki and friends from "The Lion King" at Hakuna Matata Time Dance Party, located in Africa at Disney's Animal Kingdom (starting in January 2019). Meet Pocahontas and her forest friends near the Tree of Life on the Discovery Island Trail at Disney's Animal Kingdom. Meet Russell and Dug from "Up," Flik from "A Bug's Life," and Tarzan on Discovery Island at Disney's Animal Kingdom. Dine with Lilo and Stitch in 'Ohana Best Friends Breakfast at Disney's Polynesian Resort. Meet Mary Poppins and friends at the Supercalifragilistic Breakfast at 1900 Park Fare in Disney's Grand Floridian Resort.